"...Ben has been the world-wide guru of this technology, providing support to applications of all types. His genius lies in handling the extremely complex mathematics, while at the same time seeing the practical matters involved in applying the results. 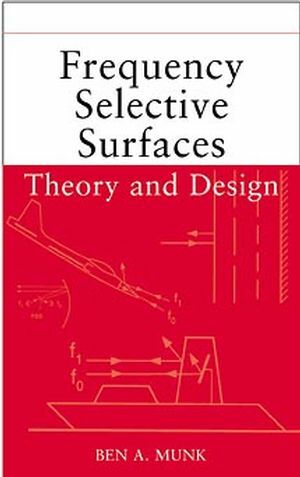 As this book clearly shows, Ben is able to relate to novices interested in using frequency selective surfaces and to explain technical details in an understandable way, liberally spiced with his special brand of humor... Ben Munk has written a book that represents the epitome of practical understanding of Frequency Selective Surfaces. He deserves all honors that might befall him for this achievement." -William F. Bahret. Mr. W. Bahret was with the United States Air Force but is now retired. From the early 50s he sponsored numerous projects concerning Radar Cross Section of airborne platforms in particular antennas and absorbers. Under his leadership grew many of the concepts used extensively today, as for example the metallic radome. In fact, he is by many considered to be the father of stealth technology. "This book compiles under one cover most of Munk's research over the past three decades. It is woven with the physical insight that he has gained and further developed as his career has grown. Ben uses mathematics to whatever extent is needed, and only as needed. This material is written so that it should be useful to engineers with a background in electromagnetics. I strongly recommend this book to any engineer with any interest in phased arrays and/or frequency selective surfaces. The physical insight that may be gained from this book will enhance their ability to treat additional array problems of their own." -Leon Peters, Jr. Professor Leon Peters, Jr., was a professor at the Ohio State University but is now retired. From the early sixties he worked on, among many other things, RCS problems involving antennas and absorbers. This book presents the complete derivation of the Periodic Method of Moments, which enables the reader to calculate quickly and efficiently the transmission and reflection properties of multi-layered Frequency Selective Surfaces comprised of either wire and/or slot elements of arbitrary shape and located in a stratified medium. However, it also gives the reader the tools to analyze multi-layered FSS's leading to specific designs of the very important Hybrid Radome, which is characterized by constant band width with angle of incidence and polarization. Further, it investigates in great detail bandstop filters with large as well as narrow bandwidth (dichroic surfaces). It also discusses for the first time, lossy elements used in producing Circuit Analog absorbers. Finally, the last chapter deals with power breakdown of FSS's when exposed to pulsed signals with high peak power. The approach followed by most other presentations simply consists of expanding the fields around the FSS, matching the boundary conditions and writing a computer program. While this enables the user to obtain calculated results, it gives very little physical insight and no help in how to design actual multi-layered FSS's. In contrast, the approach used in this title analyzes all curves of desired shapes. In particular, it discusses in great detail how to produce radomes made of FSS's located in a stratified medium (Hybrid Radomes), with constant band width for all angles of incidence and polarizations. Numerous examples are given of great practical interest. More specifically, Chapter 7 deals with the theory and design of bandpass radomes with constant bandwidth and flat tops. Examples are given for mono-, bi- and tri-planar designs. Chapter 8 deals with bandstop filters with broad as well as narrow bandwidth. Chapter 9 deals with multi-layered FSS of lossy elements, namely the so-called Circuit Analog Absorbers, designed to yield outstanding absorption with more than a decade of bandwidth. Features material previously labeled as classified by the United States Air Force. BEN A. MUNK, PhD, is Professor of Electrical Engineering at Ohio State University and a major contributor to the theory and design of periodic structures, particularly frequency selective surfaces, circuit analog absorbers, and phased arrays. Evaluating Periodic Structures: An Overview. Spectral Expansion of One- and Two-Dimensional Periodic Structures. Dipole Arrays in a Stratified Medium. Slot Arrays in a Stratified Medium. Band-Pass Filter Designs: The Hybrid Radome. Band-Stop and Dichroic Filter Designs. Jaumann and Circuit Analog Absorbers. Power Handling of Periodic Surfaces. Concluding Remarks and Future Trends.